We are proud to offer the products of our brothers and sisters in arms at Letters Of Marque from across the pond. Everything on this page we stand behind as if they were our own products. Be aware that International shipping charges apply to everything on this page and custom ordered products may have a delay in shipping as it is being made for you. 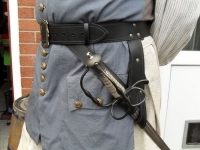 This sword belt is inspired by the ones worn by Peter the Great's army from Russia in around 1700. The belt is 1 3/4" wide and has an oval brass buckle like the original ones had. Color choices of Brown, Natural-Undyed, Black and Tan. Specify if right or left handed and we need your waist size on this one. This is a replica of the cartouche or cartridge box found in the wreckage of the Pirate ship The Whydah. It is made from Leather and stitched together using linen thread. This particular version is made to wear on a waist belt. Great for filling up with paper cartridges for living history events or just for stashing wallets, mobile phones, bars of chocolate etc. in out of view of the general public. It is 3 inches wide, 6 inches long and 5 inches high. The Whydah Gally (variously written as Whidah or Whidaw) was the flagship of the pirate "Black Sam" Bellamy. The ship sank in a storm off Cape Cod on April 26, 1717, taking Bellamy and the majority of his crew with it. Color choices of Natural Undyed, Black, Brown. This is a pouch based on the kind worn in the late medieval period but given a late 17th century twist with the shaped flap. It is made from Leather and stitched together using linen thread. This particular version is made to wear on up to a 3 inch wide waist belt. Great for filling up with period correct items for living history events or just for stashing wallets, mobile phones, bars of chocolate etc. in out of view of the general public. It It is 2 inches wide, 8.5 inches long and 8 inches high. Color choices of Natural Undyed, Black, Brown. This is a pouch based on the kind worn in the late medieval period but given a late 17th century twist with the leather toggle like was found on the Whydah box. It is made from Leather and stitched together using leather thong. This particular version is made to wear on up to a 2 inch wide waist belt. Great for filling up with period correct items for living history events or just for stashing wallets, mobile phones, bars of chocolate etc. in out of view of the general public. It It is 2 inches wide, 8.5 inches long and 8 inches high. Color choices of Natural Undyed, Black, Brown.